NEW ORLEANS – Not only did Super Bowl XLVII produce an all-time great contest, it had more storylines that a Steven King novella or Quentin Jerome Tarantino motion picture. Which quarterback will come through with the key play? Can the Ray Lewis and the Ravens’ defense keep the electric 49ers’ pistol offense misfiring? Could Joe Flacco‘s big arm bring some excitement to Super Bowl XLVII? Which Harbaugh brother would hoist the Vince Lombardi trophy? Would the New Orleans Saints loyal fandome accost NFL Commissioner Rodger Goodell after the failed bounty-gate scandal? Could second year Niner quarterback Colin Kaepernick keep the magic going? Would the Super Bowl commercials be the most memorable aspect of the broadcast? All these and more were answered at the conclusion of the NFL’s 2013 Super Bowl XLVII. As I perused New Orleans beyond the City Center, it is still evident that after enduring Hurricane Katrina, one of America’s worst tragedies. First, Super Bowl XLVII was a storybook ending for future NFL Hall of Fame middle linebacker Ray Lewis. After suffering a possible season ending arm injury, he came back just in time for the Raven’s playoff push. How important is Lewis to Baltimore? The Ravens were 5-1 to start the season and after he went out they went 5-5. After his return the team went 4-0. What more needs to be said? Lewis has the ability to galvanize a collective like no athlete ever. The Ravens would not have won this title without Lewis . . . plain and simple. Lewis joins Jerome Bettis and John Elway, just to mention a few that announced their impending retirements and won a NFL title after it. Baltimore’s Joe Flacco showed all that he is the real deal. The first half was all about Flacco. He went 13 for 20 for 192 yards and the three scores over the opening two quarters, becoming only the sixth quarterback in 47 Super Bowls to throw for that many TDs by halftime. Flacco finished 22 of 33 for 287 yards in winning Super Bowl XLVII MVP. Keeping up with his noteworthy playoff run he crushed the Niners’ defense. To get to the Super Bowl, he led the Ravens past Denver’s Peyton Manning and New England’s Tom Brady for two of his league-record six career postseason road victories by a quarterback. Then there was Jacoby Jones seemingly breaking the game wide-open with a Super Bowl record 108-yard sprint with the second-half opening kickoff. That came after Jones latched onto a thrilling 56-yard catch and run touchdown from Flacco. A New Orleans native, Jones, one of the heroes in a double-overtime playoff win at Denver, could have been or should have been the MVP. Next, John Harbaugh beat his younger brother Jim to claim the title a Super Bowl winning coach. In the 47-year history of America’s Game, there have never been two brother oppose each other in a Super Bowl. Hey, there have never been two brothers even coach in the NFL, let along challenge each other in the Big Game. Baltimore’s John Harbaugh is 15 months older than San Francisco’s Jim Harbaugh. San Francisco second year quarterback Colin Kaepernick fell inches short of joining Doug Williams as the only African-American quarterback to lead a team to Super Bowl glory. Instead he joined Donovan McNabb and Steve McNair as African-American signal callers that led their teams to the Super Bowl but fell just short of the big prize. Kaepernick couldn’t get the Ravens into the end zone on the final three plays—there was contact on Crabtree on the final pass that appeared incidental, and Jim Harbaugh insisted it was pass interference. But that is what it is. Before the game began, with 100 million or so Americans expected to tune in on TV, a chorus of 26 children from Sandy Hook Elementary School in Newtown, Conn. — where 20 students and six adults were killed in a shooting rampage in December — sang “America the Beautiful,” accompanied by “American Idol” alum Jennifer Hudson. My personal highlight was Grammy winner Alicia Keys performing the national anthem. She joined Marvin Gaye and José Feliciano with iconic renditions of America’s anthem. Hey, I’m shedding no tears for or all the coaches that are getting waxed but their teams. They make a lot of money for leading their teams into battle. However, if I was a fan of the one of the teams that did the firing I just might be upset. For example, the Chicago Bears have won only won one Super Bowl and has appeared in two. Recently fired coach Lovie Smith took the Bears to it most recent Super Bowl, where he made history joining Indianapolis Colts coach Tony Dungy as the first and only time two African-American coaches met in a Super Bowl. Dungy, Smith’s mentor lost a close contest to the Colts. Now dig this, the Detroit Lions go 4-12 and keep it coach, but the Bears go 10-6, just missing the NFL Playoffs and Smith gets canned. Football watchers believe the decision came down to the Vikings’ win over the Packers in the final week of the regular season. A win by Green Bay would have ensured a playoff berth for Chicago. Wow! How close is that? How many teams in the NFL would have loved to be in that position? It is not as if the Bears have a juggernaut franchise. They are very competitive, in fact losing in the NFC title game. I was there covering the game in frozen Solider Field in 2011 when the Packers won 21-14. Dungy, who is at the front of speculation about filling NFL open positions, tweeted: “Lovie Smith’s firing is the 1 reason I’m not coming back to get fired for only winning 10 (games). The Bears were 84-66 under Smith, but reached the playoffs just once since their Super Bowl appearance in February 2007. The fallout associated with missing the playoffs for the fifth time in six seasons proved too much to overcome for Smith. Then there is Avery Johnson head coach of the new Brooklyn Nets getting waxed after starting the season by winning 11 of their first 15 games en route to their best start in franchise history, but have going just 3-10 in December, which prompted Brooklyn’s brass to make a change. Heck this is basketball, many team have sat at .500 then turn their season around. Why so quick to pull the trigger? Johnson has won an NBA title as a player and led Dallas to the NBA Finals. But he was given a team with a number of new players that needed time to gel. The irony of the canning was Johnson had just been named Eastern Conference Coach of the Month for November. Assistant P.J. Carlisemo was named interim head coach, and retained the rest of Johnson’s staff. Johnson said he was caught off guard. “If I was the owner I would not have fired me,” he lamented. The Nets are now going after Phil Jackson, who just announced his engagement to Lakers’ owner Jerry Buss’ daughter, Jeanie. Jackson was bypassed by the Lakers in November after Mike Brown was surprisingly fired five games into the season. I do not see any way Jackson takes that job. Heck, the Lakers job, whom he coached to five NBA titles, might open up after their less than stellar showing under Mike D’Antoni. Also in the NFL Andy Reid in Philadelphia, Smith, and Ken Whisenhunt in Arizona, all coaches who took teams to the Super Bowl, plus Norv Turner in San Diego, Pat Shurmur in Cleveland, Romeo Crennel in Kansas City and Chan Gailey in Buffalo have all been shown the door. Bo Jackson: The greatest athlete ever? Pic cutline: BO JACKSON the great two-sport star. ESPN has done it once again! Its noteworthy ‘30 for 30: You Don’t Know Bo’ documentary hit the mark and jogged my memories and senses. The film examined the truths and tall tales that surround Bo Jackson, and how his seemingly impossible feats captured our collective imagination for an all-too-brief moment in time. Two sport star Bo Jackson and his famous Nike commericals. Vincent Edward “Bo” Jackson’s run (1986 to 1994) on the national sporting stage was indeed brief, but left a lasting memory for all sports aficionados. As a neophyte reporter in Los Angeles, I just so happen to have been starting my journalistic journey when Bo came to town. What a ride it was scribing about this one-of-a-kind athlete. 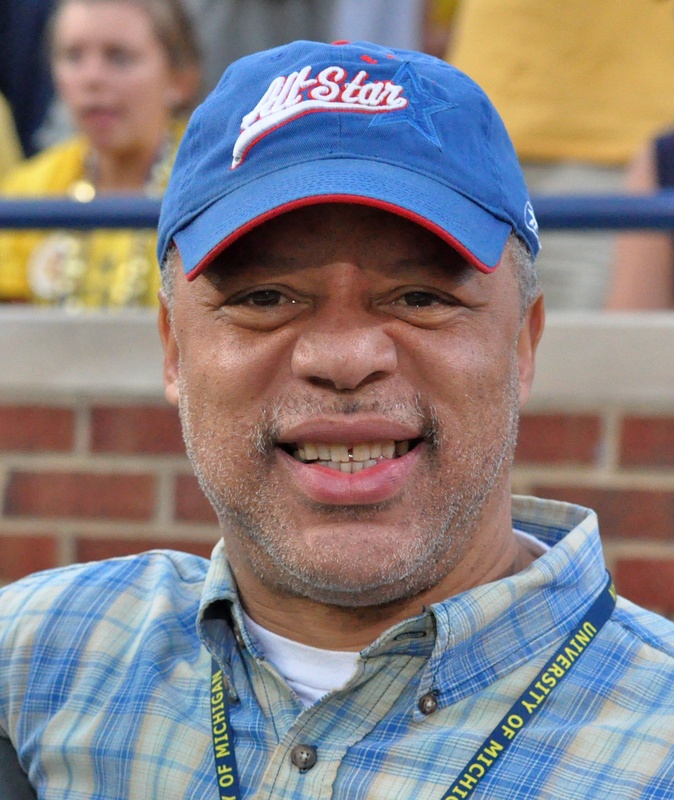 Bo, a 1985 Heisman Trophy winner while at Auburn, became the first and only athlete to be named an All-Star in two major American sports (football  and baseball ). For me one of the most memorial things about Bo was that he recorded the fastest 40-yard dash (4.12 seconds – hand-timed) ever recorded at any NFL Combine. His electrifying time is still the fastest verifiable 40-yard dash time in NFL history. At 6-foot-1, 230 pounds, Bo is the only athlete to measure up in size and speed to the great Jim Brown. Indeed his football stats are Brown-like. At Auburn in his senior year (1985), Bo rushed for 1786 yards which was the second best single-season performance in SEC history, and, his 6.4 yards per rush averaged, at the time, was the best single-season average in SEC history. 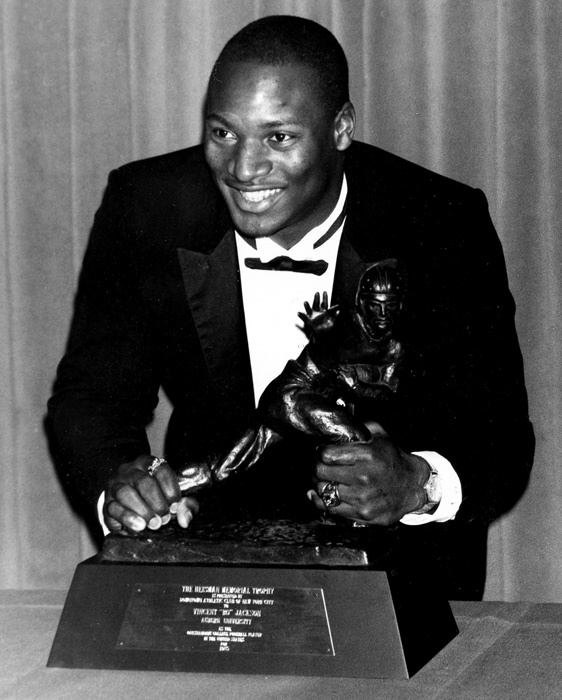 For his performance in 1985, Bo was awarded the Heisman Trophy. In baseball Bo hit over 20 homeruns in four consecutive seasons. In 1989 he had his best season clocking 32 dingers, with 105 RBI’s and 26 stolen bases and an All-Star appearance. In both sports Bo seemed to deliver on the big stage. On Monday Night Football in 1987 Jackson turned in a 221 yard rushing performance against the Seattle Seahawks. During this game, he ran over Seahawks linebacker Brian Bosworth, who had insulted Jackson and promised in a media event before the game to contain Jackson. He also unleashed a 91 yard run where he disappeared through the entrance to the field tunnel to the dressing rooms with teammates soon following. Jackson scored two rushing touchdowns and one receiving touchdown in the game. His 221 yards 29 days after his first NFL carry, is still a Monday Night Football record. Bo Jackson win the Heisman. In the 1989 baseball All-Star game Bo was named the game’s MVP for his play on both offense and defense. In the top of the first inning, he caught Pedro Guerrero’s 2-out line drive to left-center field to save two runs. Then he led off the bottom of the first—his first All-star plate appearance—with a monstrous 448-foot home run. In the 2nd inning, he beat out the throw on a potential double play to drive in the eventual winning run. He then stole 2nd base, making him one of two players in All-Star Game history to hit a home run and steal a base in the same game (the other is Willie Mays). Bo finished the game with two hits in four at-bats, one run scored and two RBI. Those are only a snippet of what Bo did as the greatest two sport athlete ever. He was perhaps the most dominant football player of his era. He ran through arm tackles like wet toilet paper and punished would-be tacklers like no other. In baseball he was the fastest and strongest player in the league. Bo Jackson was one of the brightest-shining sports stars the world has ever known. Like a magnificent comet streaking through the sky it shines bright then is gone just as quickly. During the 1991 playoffs versus Cincinnati Bo suffered a serious hip injury that ended his football career. Amazingly after sitting out the entire 1992 baseball season Jackson was able to return to the Chicago White Sox in 1993. His sports accolades led to Bo being the first international Nike spokesperson. The famous “Bo Knows” campaign was ground breaking and changed the face of athlete and shoe advertisement.